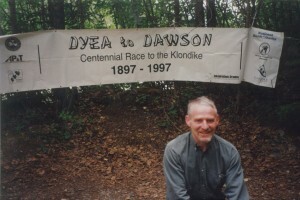 In June of 1997 Karl Dittmar and I took part in the Dyea (near Skagway, Alaska) to Dawson, Yukon International Centennial Race to the Klondike. The race was limited to 50 teams of two, and was a re-enactment of the great gold-rush stampede of 1897-98. We had a 56 Kl. hike over the Chilkoot trail and a 1000 Kl. canoe trip from Bennet Lake, through several lakes and down the mighty Yukon river to Dawson City. We each had to carry a minimum load of 22.5 Kilograms (50 lbs), which included listed compulsory items such as a gold pan, 12 inch diameter cast iron frying pan (heavy! ), hatchet, shovel, flour, beans and dried fruit – all to make it a realistic commemoration of the stampede.